This takes place every week throughout the year. 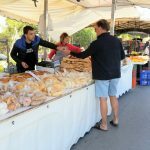 The market is always well attended, and there are often cars parked in the surrounding streets in every direction, so arrive early if you don’t want a long walk. 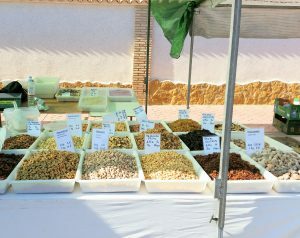 The market features a range of local seasonal produce, as well as preserved meats, spices and many types of olives. You can also buy both cut flowers and plants. There are many clothing stalls, ranging from underwear to summer wear, to more formal outfits. There are plenty of accessories available- jewellery, bags, belts and scarves. You can also buy regional dress in children’s sizes. There are many stalls selling toys and games. Children are also attracted to stalls selling sweets. Household items are also available, including art and craft items. There are many stalls selling linens, and tablecloths are a particular focus of most linen sellers. As always when purchasing from markets, be aware that quality may be variable, and that the safety of items, especially toys, should be thoroughly checked before purchase. It may not be possible to return or exchange items, so avoid impulse buys.